I love the watercolor tags. My favorite is the tags using less water. My favorite charity is the Leukemia & Lymphoma Society which is close to my heart as I was diagnosed in 2011 with non-Hodgkin’s Follicular Lymphoma. Love these tags!! My favorite charity is FARE – Food Allergy Research and Education. One of my children has a life threatening food allergy and they have been a life saver for me to help me understand and learn how to life with a food allergy. I love these!!!….. and clicked the link for to have a look-see at the oil pastel crayons. I’m going to have to see what else can be done with those beauties!!!! My charity is the Charles George VA Medical Center – Hospice Ward in Asheville, NC. Lovely tags, my kids would love making something like this. Do you think this would work on kraft card stock? One of my favorite charities is Gospel for Asia. 100% of what is donated going towards what you donate for. They help the poor and needy but they also share the good news of Jesus Christ at the same time. My kids and I are saving money to donate between now and Christmas so we can help make Christmas brighter for a family in Asia. So pretty! Can’t wait to see all of your ideas! Those pastels are excitingly( is that a word??) fabulous! Love the smooches of color. My favorite charity is the American Cancer Society, although I think Wounded Warriors is doing great work too. So excited for the tags again, Sandy! My favorite charity is a little mission hospital in rural Honduras “Hospital Loma de Luz. My husband and daughter are currently spending their vacations there now, helping out as ER nurses. It’s amazing how much they can do with so little – for people who truly have nothing materially, but who are rich in God’s love for them. Love these tags! 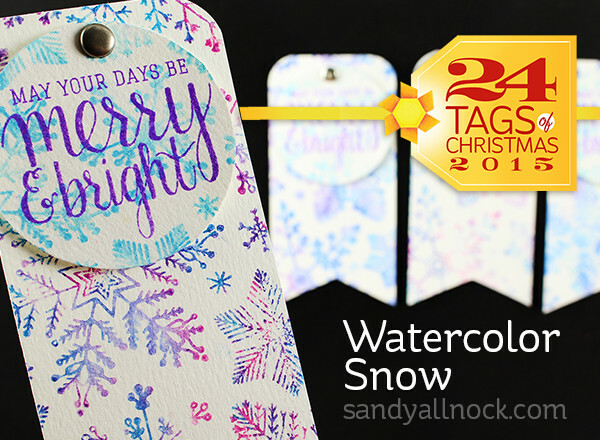 I make tags every year so I will try your technique! They are so pretty. My fav charity is American Cancer Society. Sandy, you are such a kind and generous woman. I love your Tags and my favorite charity would be an animal rescue group called Far Point in Port Trevorton, PA.
Clean and simple is great. Thanks for sharing your ideas. My favorite charity is the local food bank – Greater Pittsburgh Food Bank located in Duquesne, PA.
Love that background stamp. My charity is Cystic Fibrosis Foundation because my 2yr old was born with this horrible life threatening disease. We do everything possible to keep her as healthy as we can. Love those oil pastels. Might need them for Christmas! My favorite charity is New Beginning Gospel Ministry/India through Advancing Native Missions. This charity supports Indian missionaries that go to the small villages and share the gospel. I like how you made these. I haven’t tried oil pastels yet. I guess I’m scared of them too haha. My favorite charity is the local SPCA. I love love these tags! I’m definitely going to make tags this year! How simple when the stamps are already out when making the card! Thanks for the inspiration and reminder! Should I win the BIG prize, my charity is the Lupus Foundation of America, Mid-South Chapter. Thanks for continuing the tradition, Sandy. I love your tags, too. It is so generous and so typical of you to donate to these wonderful charities. As a triple cancer survivor/thriver, it always affected me the most seeing children having to go through treatment. I would rather go through treatment myself again if it could prevent another child from facing that diagnosis. For that reason my charity would be either The Truth 365 (or its primary sponsor, “Arms Wide Open Childhood Cancer Foundation.”) Both are registered 501(c)(3) public charities, and 100% goes to childhood cancer research. So excited to see the tags again this year! Love this technique using pastels. Thanks for sharing all your beautiful art. So enjoy – my favorite charity is the Butte Montana Emergency foodbank. So beautiful. I love your tag series. Thanks for sharing. Love the tags! I need to get some of those crayons. The colors are fantastic! Beautiful tags – I’m going to have to give this a try! My favorite charity is ABC of NC Child Development Center because their vision is to support all people living with autism spectrum disorder reach their full potential in a world where they are valued, accepted, and included. It’s near and dear to me because my oldest is on the autism spectrum. Last year I took the time to decorate each package but then I just put the dollar store sticker tag on. This year I hope to make an effort to make a nice tag. I can not wait to see what else you come up with..Thanks for the ideas. Beautiful tags Sandy! Alzheimer’s charity for me. I love this giveaway! Thank you for doing this! The charity I love is Turnersyndrome.org . My daughter has turner syndrome and faces a bunch of struggles. They are a great organization to give to. Beautiful tags Sandy! You are so inspiring, thank you for sharing so much of yourself. My favorite charities are in no particular order K9 for Warriors (I like the two for one), Compassion, St Judes. with more dignity, health and safety through access to quality sustainable menstrual health management and education. These tags are just beautiful! My favorite charity was League of Animals, as I’ve been actively participating in the TNR program for feral cats (trapped 15, still feeding whoever comes around!). However, my dear bro passed last week from a brain aneurysm, I need to do some research, but I think the brain aneurysm foundation may just be one, especially if they are doing research for how to prevent this tragedy. That is such a great idea for a giveaway. My favorite charity is the Randolph SPCA. Animals, dogs especially, have a special place in my heart. They depend on us for their needs and I would love to help the ones I can. Thank you for having such a giving heart. Lovely tags and you make it look so simple. Thanks for the chance to win one of the lovely creations. These are lovely! I really love that that it looks super detailed and complicated without being so. A charity that is near and dear to me is Worth Industries in the city of St. Louis. They are a sheltered workshop that helps people with disabilities have a dignified and safe place to work. I volunteer there and love how much they provide to the community. Thanks for being so generous with your talents and time. The tags are great. I love learning about different mediums to use on cards and your videos are really helpful. I think Brushos will be on my Christmas list thanks to one of your past videos. My favorite charity is the Orange County German Shepherd Rescue. They are located in California and are an awesome organization with terrific volunteers who work tirelessly to help these dogs. They save many, many lives each year. Thanks for all you do to share with us. Is smoodging a real word? If not, it should be. I’d like to smoodge. These are pretty tags and I can’t wait to see what else is in store. My charity would be for Special Olympics or Wounded Warrior or American Cancer Society. OMG……..there are so many charities that need help. Love , love , love your work !! What a beautifully colored snowy background! Love the layered tags. My favorite charity is the Beagle Freedom Project.